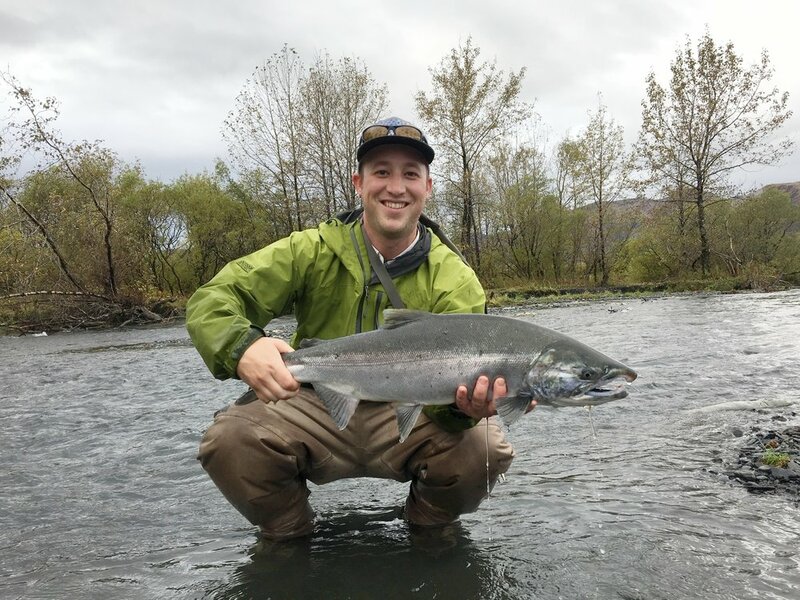 The Coho (Silver) salmon is a perfect gamefish in every way, and the rivers in the Saltery drainage host some of their most impressive runs on Kodiak Island. Although certain subspecies of Coho are threatened in the Lower 48, the Kodiak population is robust enough to accommodate both commercial and recreational fisheries. “Robust” is a good word to describe the Coho. “Magnificent” and “ridiculous” aren’t too far off the mark either. Although there’s no such thing as an unimpressive fish at Saltery, the Coho is simply peerless. It is large (average size is 10 pounds, but we have caught them up to 24 pounds), aggressive, a ballistic fighter, aesthetically stunning, and delicious. The Coho’s appearance on the scene is usually announced by the first heavy rain at the end of August, and their run continues into the beginning of October. Even the most traveled, jaded angler is usually incapable of masking their childlike glee at their first glimpse of a pool filled to the brim with Silvers. When conditions are right (which is most of the time), Coho are one of the least discriminating eaters you can catch with a rod and reel. At the end of a fishing session, our guests can often be spotted doing the “Silver windmill” with their casting arm, shaking out the wonderful fatigue that sets in after catching enormous fish for hours at a time. Silvers will chase everything from spinners to roe to surface flies, sometimes racing one another to be the one that gets caught. And like the Sockeye, when hooked, the Coho will usually provide at least two or three huge jumps before coming to hand. Sometimes more. Sometimes many, many more. We catch Silvers everywhere except for Lake Creek, the narrow creek that runs behind the lodge. Oftentimes, at the height of the run, the question becomes not where to find them, but what kind of scenery you want in the backdrop of your photos, and what kind of water you prefer to fish. From the pastoral, slow-tumbling runs of Hearst Creek to the feral, boulder-strewn rugged beauty of Rough Creek, there are myriad fishing options. If you’ve never watched a sea-fresh Coho launch itself at your lure or fly with Kamikaze determination, Saltery Lake Lodge is one of Alaska’s best opportunities for you to experience it over, and over, and over again. Until you’re spinning your arm and grinning like the rest of us. Flies: large Bunny Leeches, Popsicles, Egg-Sucking Leeches, large Deceivers. In most conditions, Coho will aggressively take any fly that is large, brightly-colored, and has some degree of motion or articulation. In low-water/bright sunlight conditions, it’s also a good idea to have some smaller, darker flies, like size 4-6 purple and black woolly buggers. Special mention: our favorite Coho fly is the Dolly Llama, a black-and-white articulated bunny leech. It has a mysterious ability to provoke even the most reticent Coho to bite, and often out-performs any other fly.